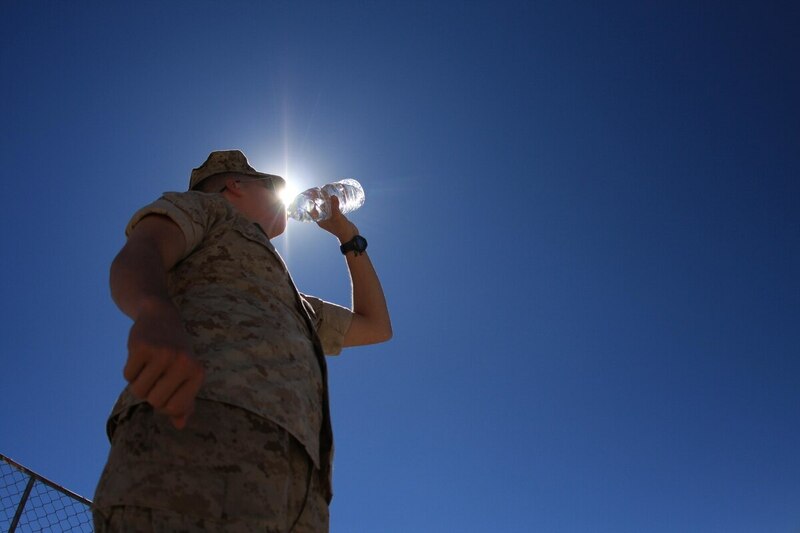 Despite guidance that's been in place, relatively unchanged, for decades, and warnings ranging from PowerPoint presentations to charts breaking down urine color, more than 2,500 active-duty service members suffered some form of heat-related ailment in 2016. That figure, slightly up from 2015's total, included 401 cases of heat stroke and 2,153 reports of "other heat illnesses," according to March's Medical Surveillance Monthly Report from the Defense Health Agency. The report calls heat illnesses "a significant threat to both the health of U.S. military members and the effectiveness of military operations." So service members receive training on how to diagnose and treat such illnesses, how much water they should drink to remain hydrated, how to adjust hydration and work schedules based on environmental factors — break out the wet bulb globe temperature index calculator to gauge the threat level — and, yes, how to gauge their hydration levels based on urine color. Army: 1,441 total heat-related illnesses (205 heat stroke cases, 1,236 other). Air Force: 205 total (16/189). Marine Corps: 734 total (151/583). "You can mitigate the problem, but you can't get away from it altogether," said Samuel Cheuvront, a research physiologist with the thermal and mountain medicine division at the Army Research Institute of Environmental Medicine. "It's just like any intractable problem; there is always going to be some risk. " Get the facts. While hydration and other related guidelines have remained about the same for decades — the Army’s Technical Bulletin-Medical 507, which includes all relevant advisories on the topic has been updated just once since 1980 — not every unit or installation follows all of the established procedures. "We visit a lot of posts every summer … where posts are following their own post guidelines," Cheuvront said. "There’s a lot of turnover. Sometimes information gets lost." Adjust on the fly. Researchers have shown climate acclimatization helps limit heat illness, but service members arriving at a warm-climate installation likely won’t be eased into their surroundings. "It’s just accepted that once you’ve been there for a couple of weeks, that you’re heat-acclimated anyway," Cheuvront said. Rough terrain. Some military workplaces, particularly training environments, make it impractical to follow every warning regarding work levels in various heat conditions. It’s also tough to have all recommended care measures in place — for example, full-body immersion in cold water may be a suggested treatment, Cheuvront said, but "as you can imagine, the equivalent of a kiddie pool of ice water isn’t something we can have in a training environment. It would melt, for one thing." While commanders should monitor and encourage water intake, not every service member struggling through a ruck or a workout needs more to drink. In some cases, it's very much the opposite. DoD also tracks exertional hyponatremia, a condition where sodium levels in the bloodstream drop to dangerous levels as a result of physical activity. This can be caused by severe sodium losses to sweat, but also by drinking more water (or other fluids, including sports drinks) than the body can process. More than 1,500 active-duty troops were diagnosed with exertional hyponatremia from 2001-2016, DoD figures show, with 85 cases in last year. Most of that year's cases were soldiers (31), with 15 sailors, 22 airmen and 17 Marines. The Marines far outpace the other services when it comes to per-capita incidents, however; and have done so in every year since 2001. Marine Corps Recruit Depot Parris Island, South Carolina, had 14.1 percent of all cases over that time frame; no other installation tops 7 percent. "There is purposeful lack of sleep, lack of food, heavy activity" for recruits at Parris Island, Cheuvront said. "It's part of the course in the graduation, often in a very hot environment. There are a disproportionate amount of hyponatremia cases that occur in that situation." Recruits under calorie restriction may not get enough sodium. Drinking too much water during exercise makes the problem worse. While Cheuvront said troops eating Meals, Ready-to-Eat or other service-provided food generally "don't need to drink anything beyond water" after physical activity, those undergoing Marine recruit training or in other "high-risk situations" may benefit from oral rehydration solutions, which contain salts and sugars. Fort Benning, Georgia (1,451 incidents, 12.1 percent of total). Fort Bragg, North Carolina (1,409 incidents, 11.8 percent). Fort Jackson, South Carolina (911 incidents, 7.6 percent). Marine Corps Base Camp Lejeune/Marine Corps Air Station Cherry Point, N.C. (661 incidents, 5.5 percent). Fort Campbell, Kentucky (579 incidents, 4.8 percent). Marine Corps Recruit Depot Parris Island/Marine Corps Air Station Beaufort, S.C. (498 incidents, 4.2 percent). Fort Polk, Louisiana (468 incidents, 3.9 percent). Marine Corps Base Camp Pendleton, Calif. (393 incidents, 3.3 percent). Fort Hood, Texas (308 incidents, 2.6 percent). Naval Medical Center San Diego (276 incidents, 2.3 percent).